This color and weave is decorated plain weave. I have nine weft colors to put on trial. Which ones will pass the test? The winners will be used to weave colorful placemats for our Texas hill country home. All 8/2 cotton, with a small quill of each color waiting to be sampled. The two end tubes on the left are the same coral and camel as the stripes of the warp. 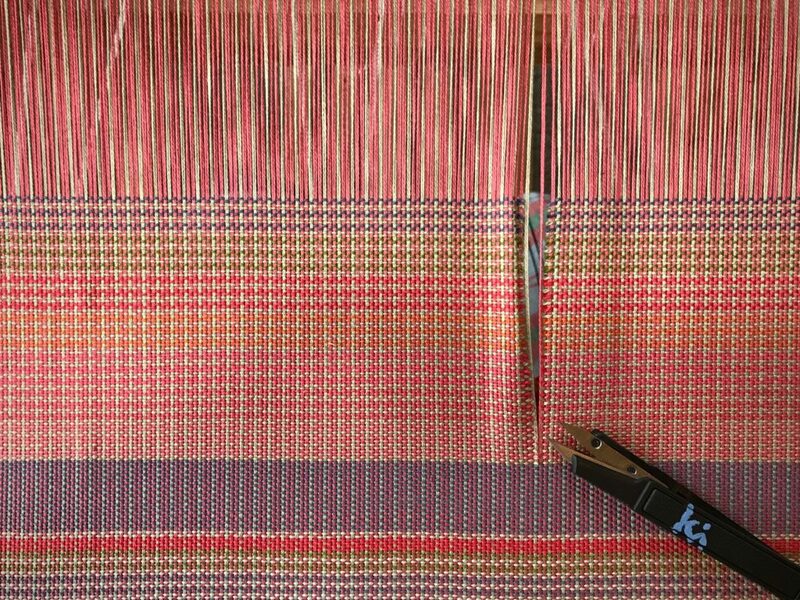 Eager to begin, I start weaving, despite knowing that evening is approaching. 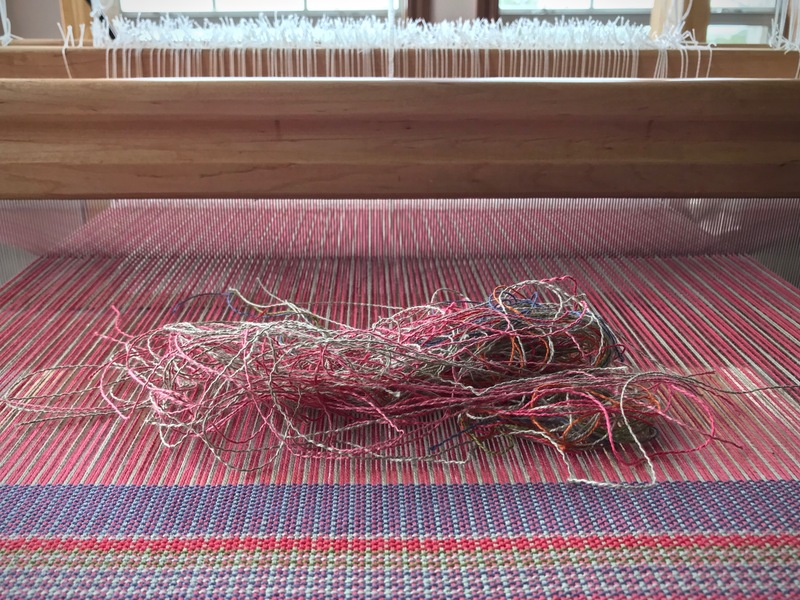 Even with good lighting at the loom, it is hard to judge the colors. I need daylight! 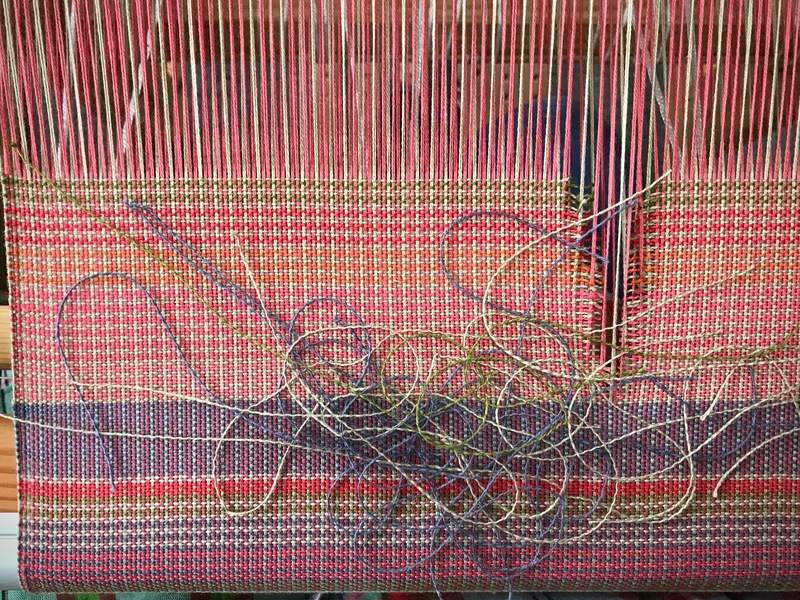 Weaving at dusk does not give me a true indication of how the colors work, even though I have a good light at my loom. The morning light does not disappoint. I find that the colors that are the most similar to the coral and camel in the warp showcase the color-and-weave pattern. The slate and apple green win, too, because they add welcome color contrast. The abundance of natural light in the room makes it easy to see the impact of each of these colors. Natural light of the morning gives a true perspective of the colors. 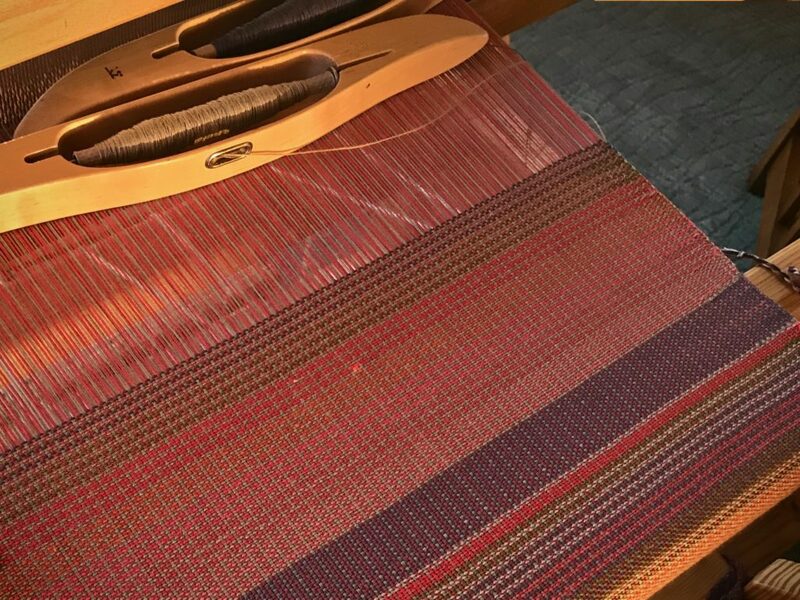 Even the subtle differences of weft colors can be seen. Keeping the camel color in one of the two shuttles helps bring out the color-and-weave effects. Which colors win? All nine of them! We have been given a well-lit path. When we choose to go our own way, with our own artificial light, our perceptions can be off. There is a kingdom of light where Jesus is on the throne. To be one of his subjects is to be in a place where his light reveals true colors. He exchanges our colors with his own to make color-and-weave fabric that is heavenly! May you be invigorated with color. I like your analogy of artificial light guiding our way. I think the artificial light being shown by so many groups has been blinding to so many people. We think we are enlightened because it’s easier than sticking to Heavenly Father’s guide book. Being a woman who likes colors and patterns, I think all those colors are winners too. Hi Annie, It’s easy to fool ourselves, isn’t it? I was surprised how well some of the colors work. The red and orange, for example, could clash with the coral warp, but here, those two colors look exceptional! The transformation of looms has begun! One by one, three empty looms are awakened from their rest. 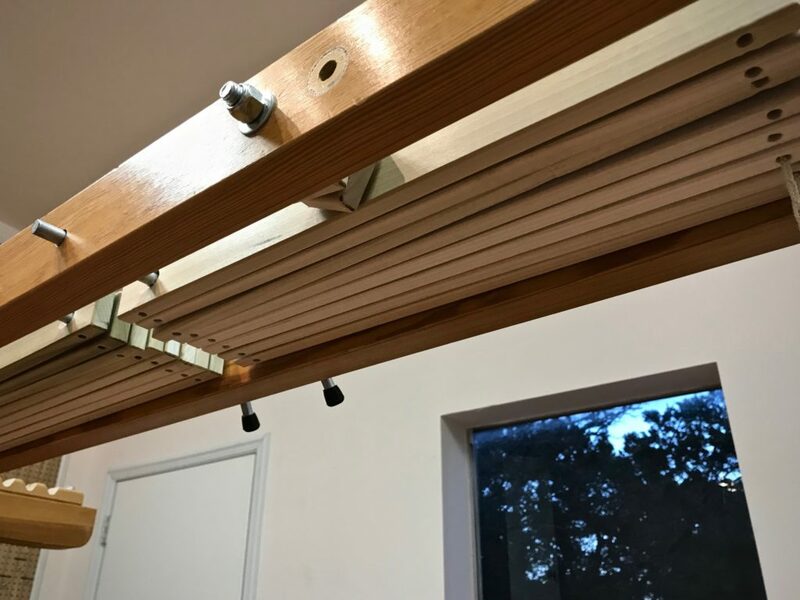 Two of three warps have been wound, and I have started dressing one of the looms. 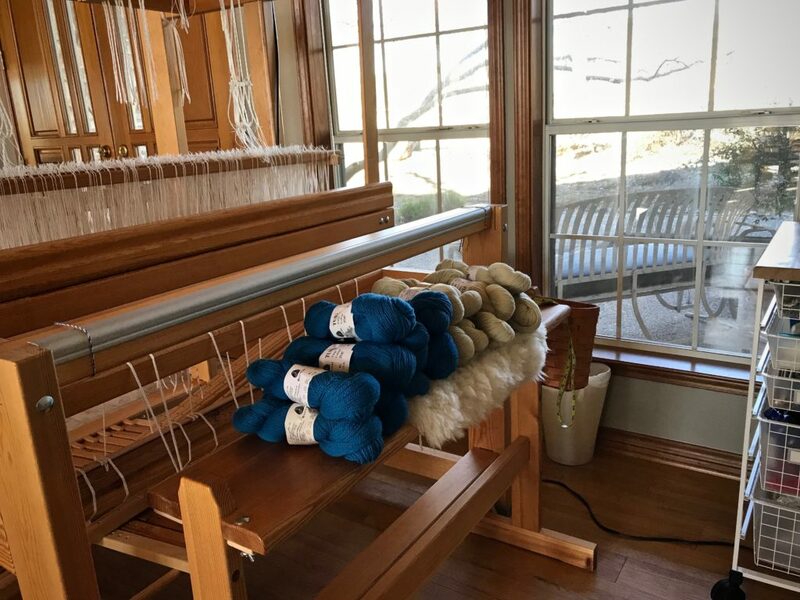 Soon, all three looms will be active as I weave coordinating textiles for our Texas hill country home. Cotton and linen threads for the planned coordinating textiles. Warp beam is clothed with a narrow-striped warp. 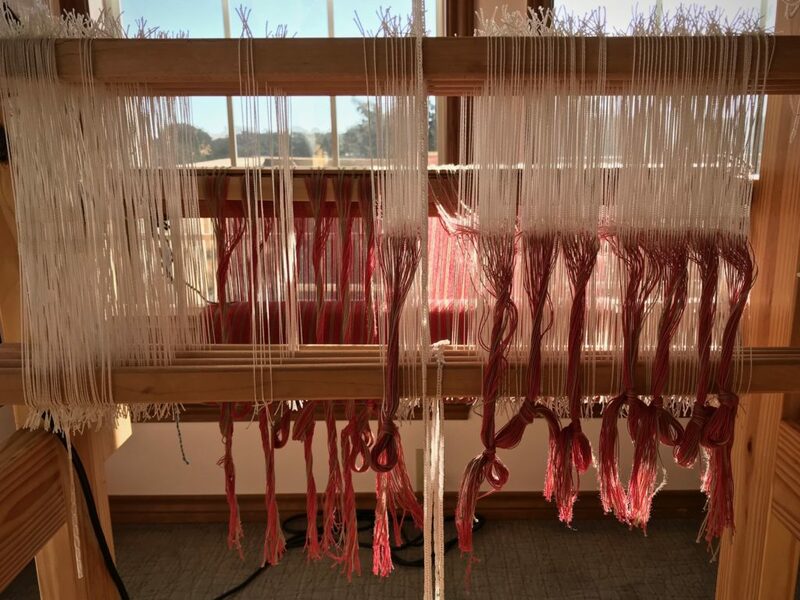 A separate warp chain for each color and two sets of lease sticks make the beaming process a little tricky. 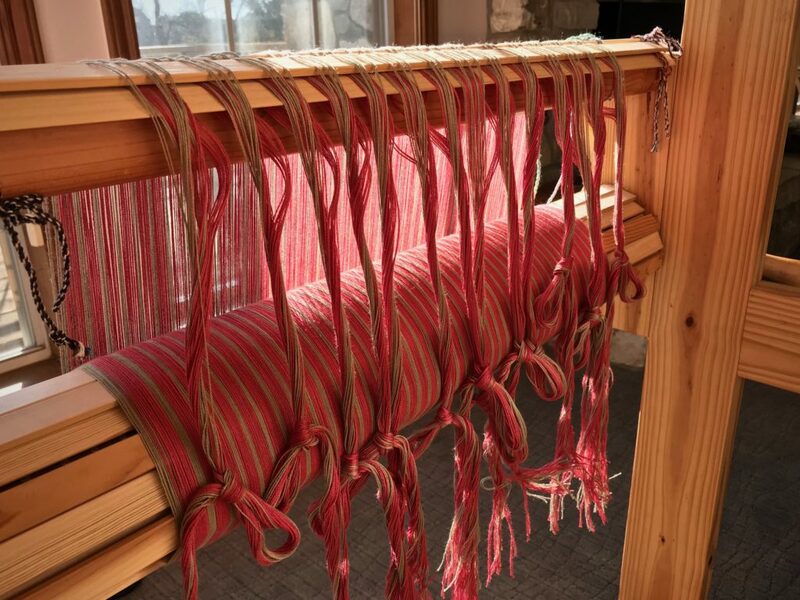 This loom at our hill country home has a warp designated for placemats. 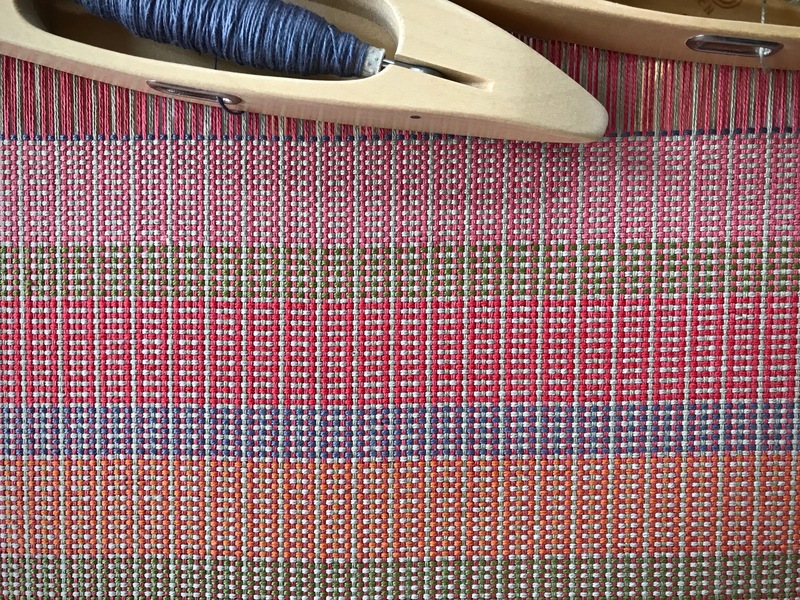 Color-and-weave effects will take the simple two-treadle plain weave up a notch, starting with the warp stripes. Is there anything as inviting as stripes on the warp beam? The loom that was bare now holds great promise. Threading the loom happens in the brightest corner of the house. Warp stripes form the base of interesting color-and-weave effects. Love transforms people. Someone who feels empty is given purpose and hope when they are loved. A reason for being. A start toward something meaningful. Real love is extreme. Love is defined by the ultimate giving up of self-centered motives, as demonstrated by Jesus Christ. This is the extreme love that we have been given, and have been called to give. 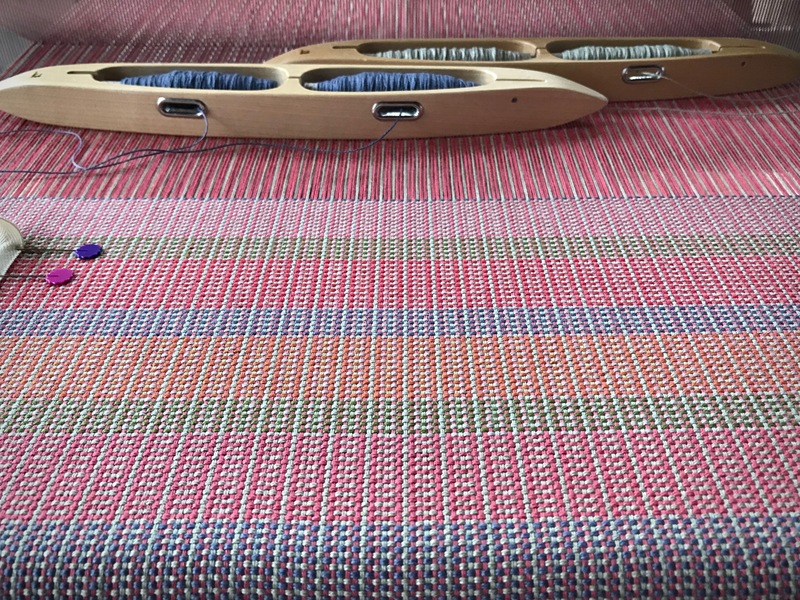 We’ve known the joy of stripes on the warp beam becoming handwoven fabric before our eyes. And we relish the thought of sharing that joy with someone else. May you awaken empty looms. 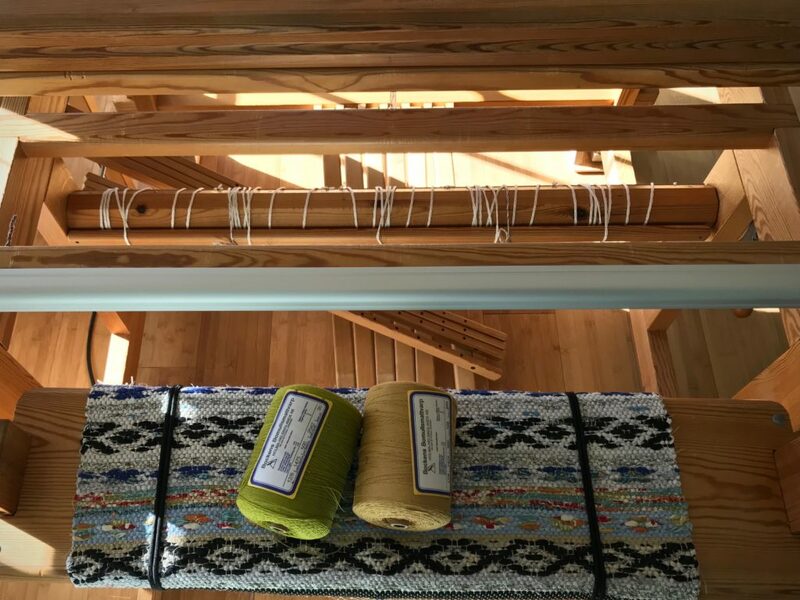 I’m excited to follow your journey of weaving all the coordinating textiles for your hill country home. 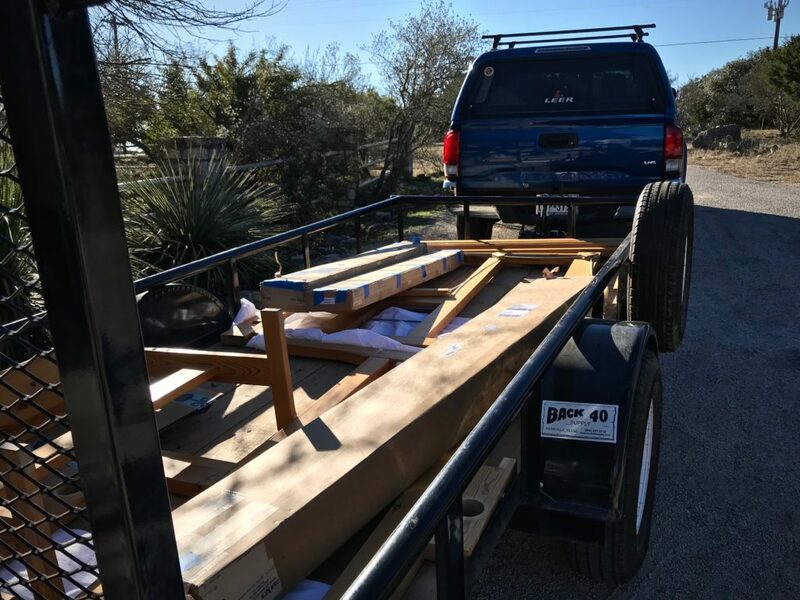 Thanks for including us on your way! Hi Cindy, I’m excited about it, too! It will be fun to see it unfold. 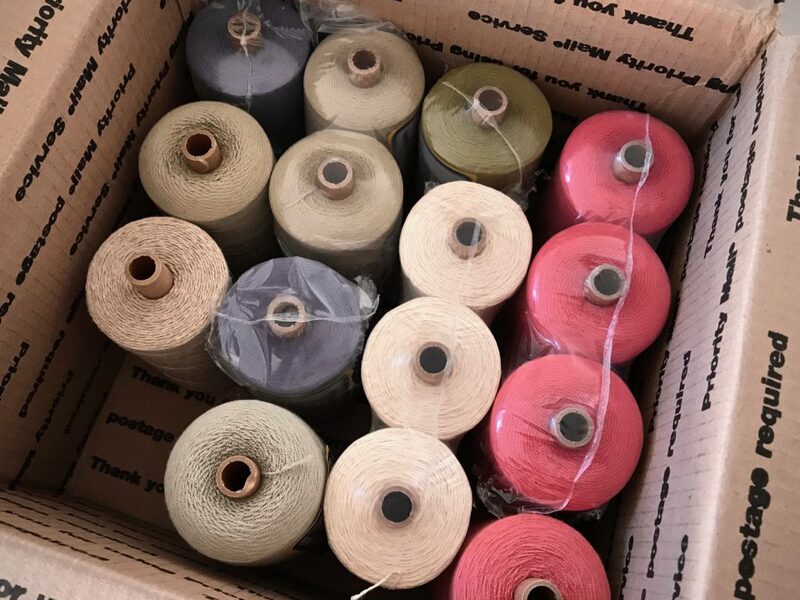 One of my favorite things is to open a box of cone yarns, it is like Christmas morning. Looking forward to seeing your new weaving creations. Oh Martha, I’m with you! Weaving yarns are so pretty boxed up. And opening a box of them makes me tingle with excitement. I am getting a malware message from my security software. Have you been hacked somehow? Hi Mary, Thank you for bringing this to my attention. My website was hacked a few weeks ago, but that has all been resolved. Warped for Good may have been put on a blacklist by your security software. If you can find that list, you should be able to uncheck Warped for Good. Then, you can safely return to this site, knowing that your security software will warn you if it is a problem again. I’m sorry for the hassle. I have a grand idea for this new year! 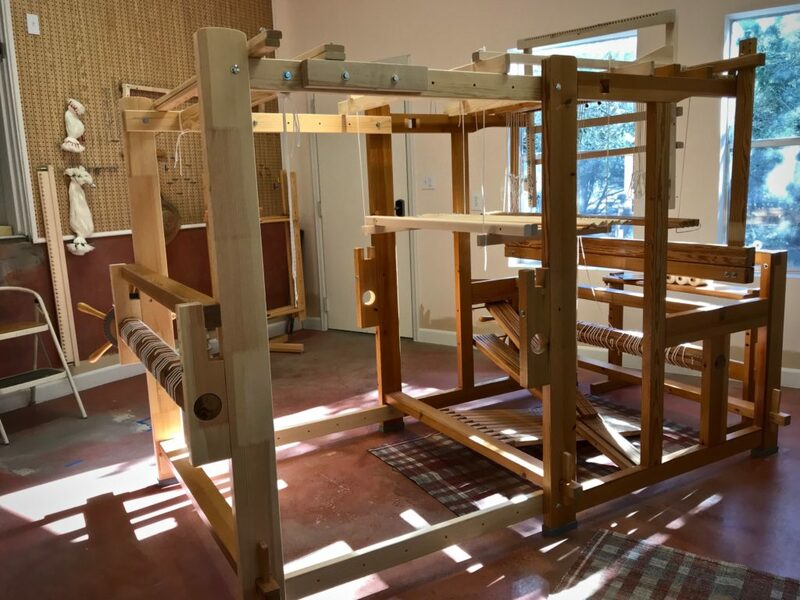 Put all three looms to work simultaneously to weave a coordinated set of textiles for the Texas hill country house. 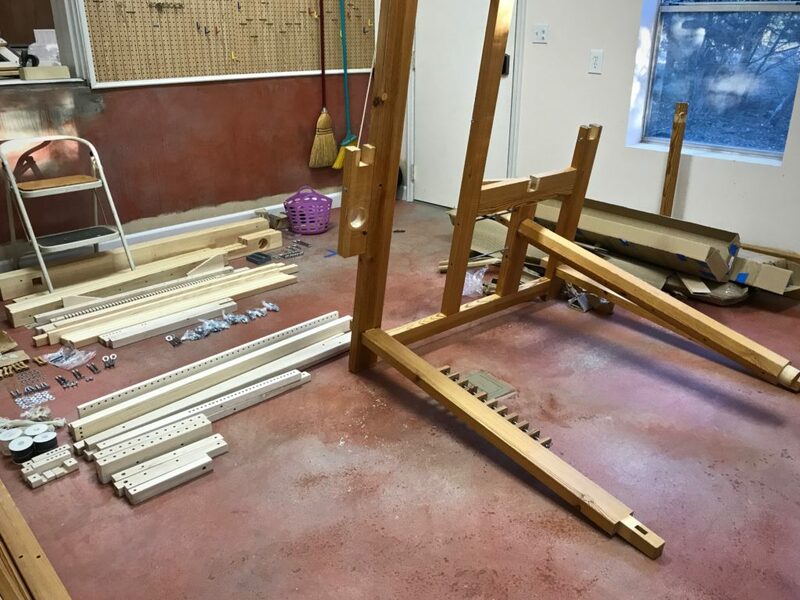 My Glimåkra Ideal loom and the little hand-built loom are bare and ready. Imagine the action! I’ll take you along as I wind warps, dress looms, and weave the harmonized threads. While I wait for ordered yarn, I am weaving the linen satin dräll towels that remain on the Glimåkra Standard loom. Soon, this loom will be bare and ready, too. Beginning the third of six linen towels in five-shaft satin dräll. Two picks of red thread mark the cutting line between towels. 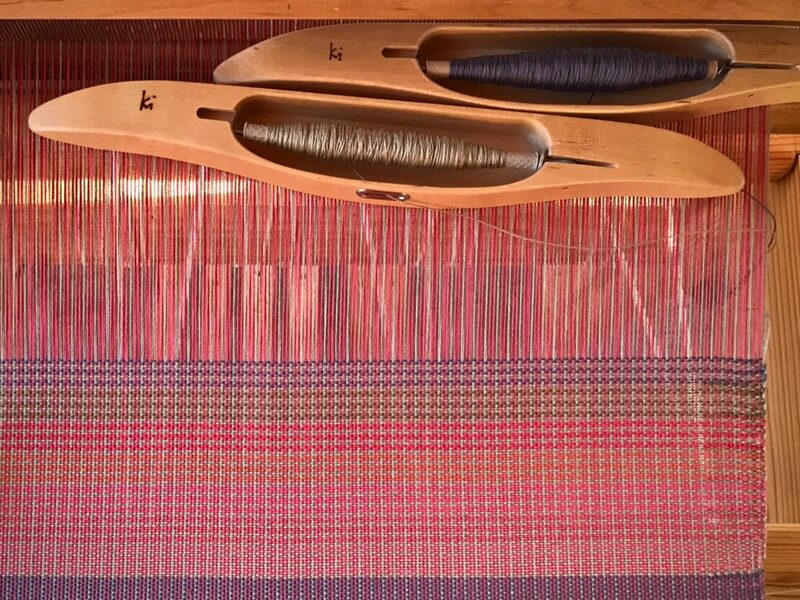 Before embarking on a new year of weaving adventures, though, I want to fully stop and count my blessings. And YOU are one of those amazing blessings. Thank you from my heart for being friends who share in this journey with me. Take a look back with me through 2017! Great slide show! I so admire your work. Thank you for sharing and inspiring. Good morning, Beth! Your kind words mean a lot, especially since your work has long been something I admire. 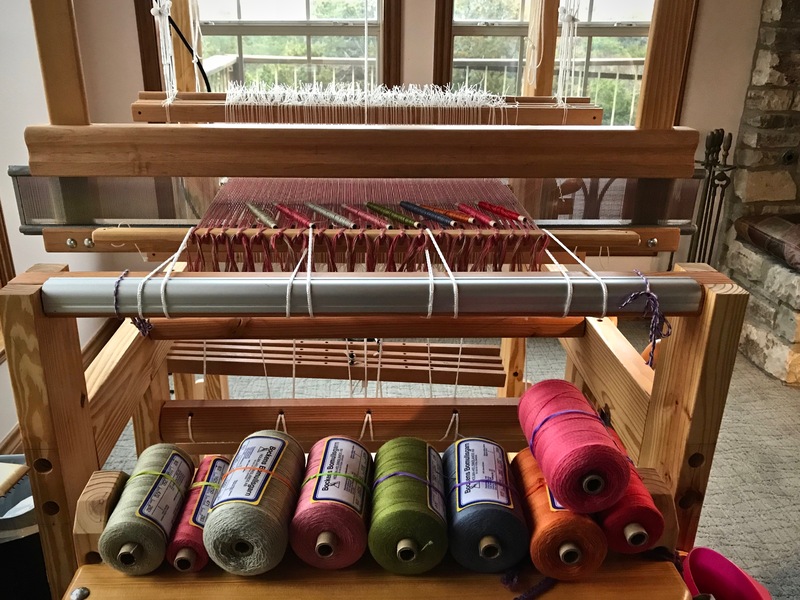 On this blustery cold day in New England, your presentation of your 2017 weaving projects, in review, was most welcome and inspiring. Currently I weave on a 12 harness Öxabäck. One question, what make and model sewing machine do you use? Unfortunately my Husqvarna 6030 appears to have seen it’s last days, so would appreciate knowing what modern machine works best for you, especially on heavier wovens, e.g. with use of rags (not necessarily rugs). Hi JAN, You weave on the Cadillac of looms, then, as I’ve been told! Wonderful! My sewing machine is my trusty 40-year-old simple Bernina. It does almost everything I need it to do, and I hope it never dies. Someday, I might add some sort of commercial sewing machine that can handle thicker and heavier things. I have sewn relatively thick seams on this machine; however, I must confess that I have also broken many needles in the process. I’ve never had a fancy computerized machine. I’m not sure I would know what to do with it. Thank you for the lovely slide show! Happy New Year! Hi Linda, I appreciate that! Enjoyed your slide show. It has been fun watching your projects develop this year. Your have a good eye for color. i am excited to see what comes next. i just bought a towel kit of yours from lunatic fringe. i am going to show my friend how to do this, before we go to vavstuga next fall. Hi Ellen, Wow, so many exciting things on your horizon! Hooray to all of it, especially your upcoming experience at Vavstuga! Beautiful slide show…and amazing productiveness. 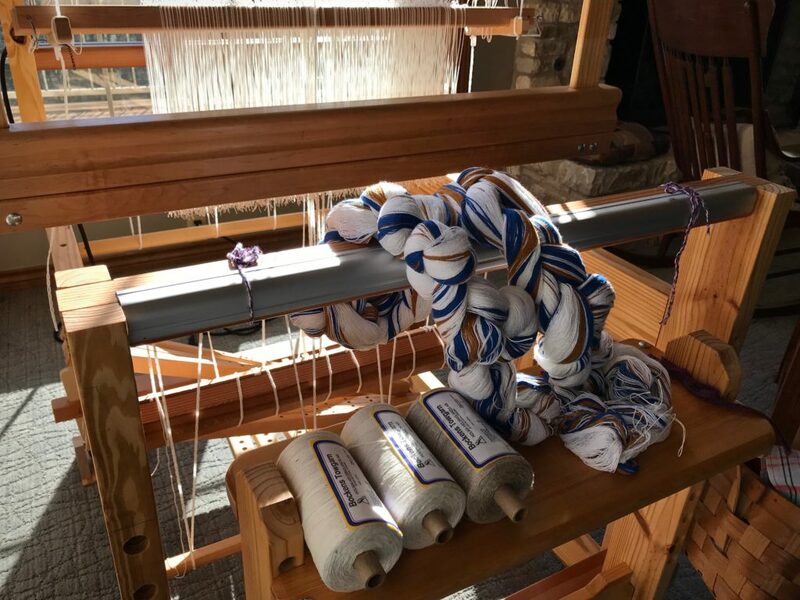 Do you have any “New Year’s resolutions” to suggest for those of us who seem to produce so little weaving despite good intentions and three looms? Do you weave all day every day? Do you not have other things you either want or must do? I really appreciate you taking the time to share all this weaving with others! Hi Nanette, You are so sweet! My desire is to weave every day, but there are many days that other responsibilities keep me from the looms. 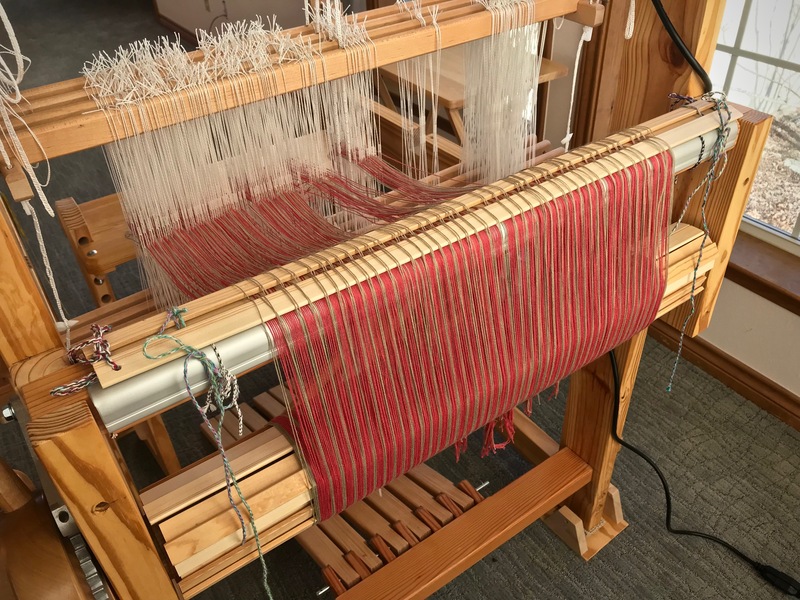 It is rare that I spend more than one or two hours at the loom on any given day. The truth is, there are few things I would rather be doing than weaving. One thing that helps me is that I have a “revolving door” mindset with my looms. I don’t want to see my looms empty, so I keep a perpetual schedule of preparing for the next thing. When I have started the actual weaving on a loom, I sit down and plan the next project, and order the yarn. When the loom is empty, I wind the new warp. 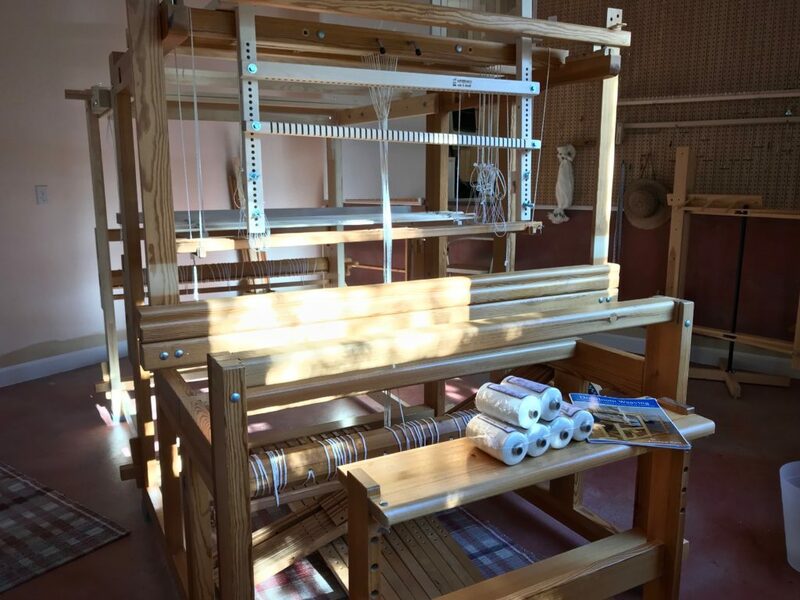 When I wind a warp, I take it immediately to the loom it is going to dress. 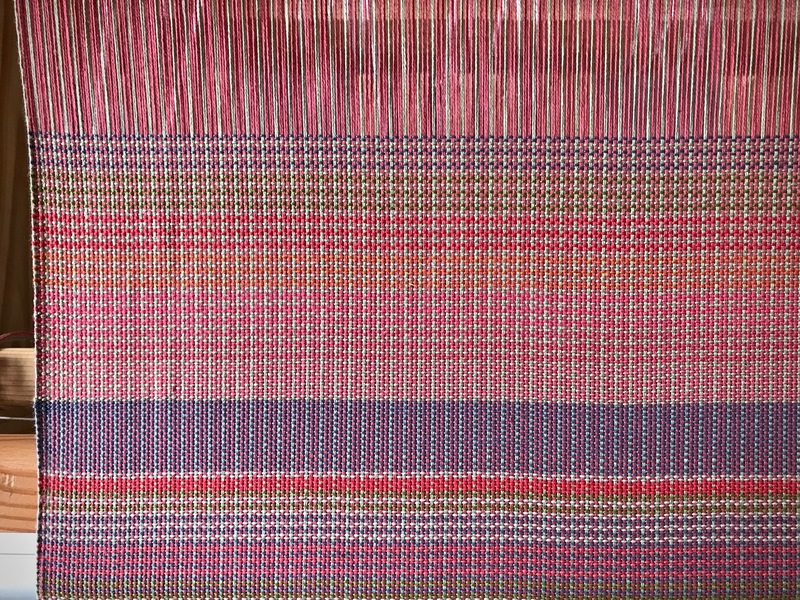 And I can’t stop myself from weaving on a newly dressed loom! Thanks so much for your gracious encouragement! Karen, wow have you done a lot this past year, I am so happy that you have included us in your journey. Loved the video! Hi Liberty, It’s always a treat to hear from you. Hi Carolyn, Thanks so much for the vote of confidence! I’m excited about attempting this coordinated effort. Thank you for sharing Karen. So inspiring to see your successes from the past year. I will take a hint from you (from one of your messages above) and try and keep my three looms warped at all times! This year I start a three year weaving course with Liz Calnan (in Australia) and I’m very excited to take my weaving to a much more professional and accomplished standard. I look forward to seeing what you get up to this year. Hi Alison, What a great opportunity you have to take a three-year weaving course! That sounds fantastic. You’ll need to teach me some of the tips and skills that you learn. What an amazing variety of items you accomplished this past year! 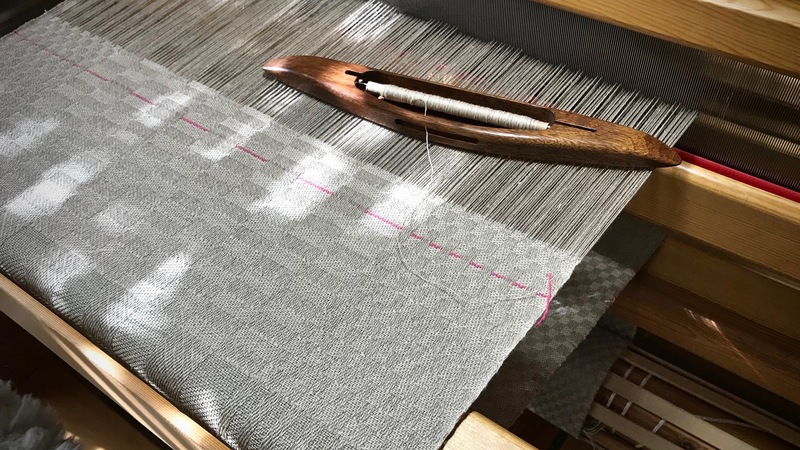 I was already in awe of the quality of your weaving and now I am floored at how much you accomplished in just a few hours a day! Thank you so much for sharing. I am looking forward to the new year and your new projects. Hi Annie, I never feel like I’m weaving that much, but when I look back I’m a little surprised myself! I’m not particularly fast, but I’m pretty consistent. It makes me think of a recording of “The Tortoise and the Hare” that my sisters and I listened to when we were girls. I can still hear the deep voice of the tortoise, “I may be slo-o-o-o-w, but I’m su-u-u-u-u-re!” HaHa, that’s me.